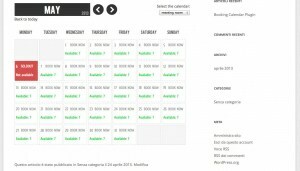 If you’re looking for a plugin that allows you to book time slots within a calendar then this simple plugin might be what you’re looking for. It cost me $17 at themeforest to purchase the extended features but if you’re willing to give a try you can visit the link below. I was able to figure out how to get this plugin up and running in no time due to it’s very user friendly interface. 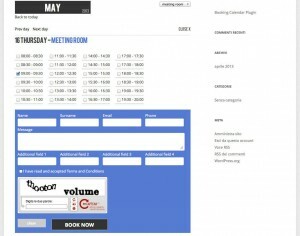 I personally used this plugin on a website that was for a sports complex which needed a way for their customers to book time slots for their tennis courts I was able to create a schedule that worked between 9-5, set the number of spaces available, set the price of the booking and connect it with PayPal, disallow bookings for holidays and more. One limitation is that registrant’s can only book individual time slots. I revisited this plugin for a personal trainers website and found it wasn’t a good fit. I was looking to create different personal training packages that would limit users the number of bookings based on whichever package they chose. Unfortunately this WordPress Booking Calendar isn’t that sophisticated but still decent for simple booking scenarios that allow people to make bookings whenever they want and pay.